Star Wars: The Clone Wars is exactly what its title suggests. It takes place between Attack of the Clones and Revenge of the Sith, and details Anakin Skywalker's downward path to the Dark Side; Obi-Wan Kenobi's ascension to leadership, and the Clone Army's various battles alongside the Jedi until Emperor Palpatine issues Order 66. After five seasons the final one was released on Netflix, and left some pretty big cliffhangers. One is immediately picked up on in this trailer and it's the return of Ahsoka Tano, Anakin's padewan who left the Jedo Order after being framed for a crime she didn't commit. I'm not sure who that Mandalorian is with her, but their presence is probably going to be a big deal. 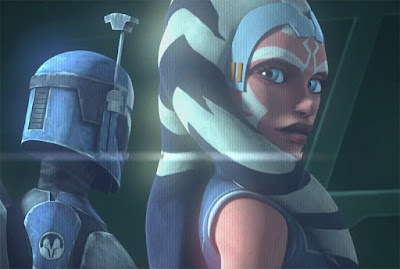 We've seen Tano since, but that was in Star Wars Rebels which takes place years later. The Clone Wars ended after five broadcast seasons — just as Ahsoka left the Jedi Order. A few post-Season Five episodes were later released as “The Lost Missions,” but the story wasn’t over. Fans have clamored for Disney and Lucasfilm to finish what was started ever since. And now it’s actually happening.